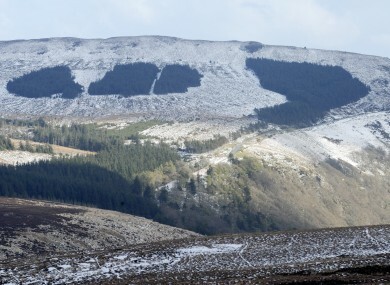 MOTORISTS HAVE BEEN urged to take extra caution around the Sally Gap area in Wicklow after mountain rescue teams were called out twice yesterday to help vehicles in trouble due to adverse weather. Wicklow’s mountain rescue teams said they are concerned about an increased number of people heading to the hills over the bank holiday weekend. They urged people to take precautions such as not travelling on roads which have snow or ice on them and to wear appropriate clothing. The teams said motorists should avoid all roads leading to the Sally Gap until further notice. Met Éireann has ended the weather warning which had been in place for most of the week across many counties – but warned that it is going to remain very cold over the Easter weekend. Temperatures are expected to hit highs of between 4 and 7 degrees Celsius today with no snow forecast for the rest of the day. However tonight will see temperatures fall to – 3 degrees in some parts of the country with frost and ice. Temperatures are expected to only begin rising to more seasonal temperatures towards the end of next week. Email “Motorists urged to avoid Sally Gap after two rescues”. Feedback on “Motorists urged to avoid Sally Gap after two rescues”.